Almost every time I give a presentation on PDIA (and I have given many), I hear excuses about why PDIA cannot be done in development. So, I’ve decided to set the record straight. I am writing a blog post and drawing a picture for each of the four most common excuses I hear. This is the first one. 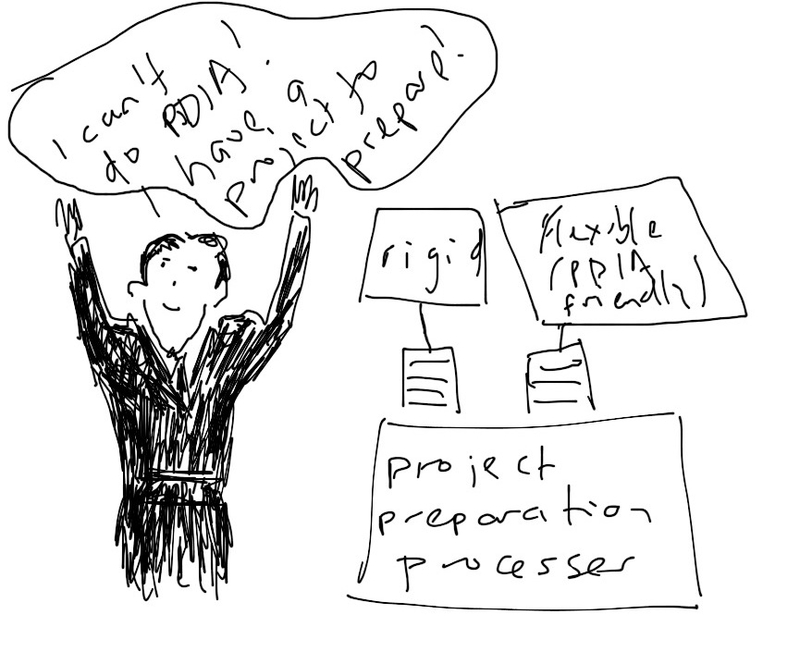 Excuse 1: International development experts often tell me that they cannot do PDIA because they have to produce projects and project processes don’t allow the flexibility implied in PDIA. This is simply not true. Every development agency I know of, has traditional project mechanisms that are rigid and foster disciplined process BUT every development agency also has instruments that allow experimentation and flexibility. The names of these instruments differ but common tools have (over time) included trust funds, learning and innovation loans, adaptable projects, and even some results based loans. So, development experts can find tools to do flexible problem identification and active project design and implementation IF THEY KNOW THESE ALTERNATIVES EXIST AND TAKE THE EFFORT TO USE THEM. If they choose not to use these alternatives because they are risky, or hard, or different, that is one thing. But experts should stop saying that these alternatives do not exist. If you want an example, read the PDIA in Cameroon blog post.